Enclosed is the update of activity for April, 2012 thru June 2012. There were a total of 108 new listings. There were 89 pending sales. Of the residential sales there were 58 sales between $250,000 and $600,000, 18 sales between $601,000 and $999,999, 9 sale over $1,000,000, 1 commercial sale and 4 land sales. There were 70 sale completes. Their were 87 price decreases and no price increases. The number of current listings are up at 293 listings specific to the Santa Ynez Valley. Rates continue to fluctuate on a daily basis. Conforming 30 year fixed rates up to $417,000 are at 3.625% at no points and Jumbo Conforming Loans which are loans up to $626,500 are at 3.75% at no points and Super Jumbo Loans which are loans up to $1,000,000 are at 4.50% at no points for origination. The Jumbo 30/5 year ARM Interest Only is at 3.0% at no points. The 11th District Cost of Funds index (COFI) is down at 1.118 for the month of July. The 6 month LIBOR rate is at 0.73; last month it was at 0.74; 12 months ago it was at 0.40. Instead of talking my own opinions in this letter I thought I would include an article I spotted in the WSJ today. It makes some interesting points and I thought was very well written. They also agree with us that every piece of economic advice needs to be skewed to your own particular area so I will try to put a North County/Santa Ynez Valley slant on this article. The great news is that home prices at least in the price ranges under 1 million have stabilized here in the Valley also. And with a little more data coming in this year that may also be true for the upper end also. They appear to have stabilized at the mid year 2002 values; that is not the greatest news for those purchasers who bought in the 6 years after that date but it appears the downward spiral is over. The economy and the real estate market still has a long way to go because the bounceback to the previous highs will be a long time coming. The recession of 1989, yes we were in real estate way back then, took until 2000 to recover. The WSJ provided us with a great graph which gives us an instant summary snapshot into that recovery and it matches my data collection very closely. Their advice if you are waiting to make a move.......Dont't hold your breath. Our local market will like all other markets will depend on two factors: rents and valuations. If it is cheaper to rent, than buy or rents are stagnant, prices will need longer to recover. If rents are rising, you can expect prices to rise also. That last one is a true statement for Santa Ynez Valley properties, rents are on the uptick. We are lucky.... we have great schools.... great weather......great neighbors, low crime and a great community. We have Location, Location, Location in spades. I want to make a statement about great schools and why I put it first on my list... they remain one of the most important aspects of our community life. Keep our great teachers, keep our schools updated both curriculum and facilities, and keep them safe. Those concepts should be of MAJOR importance to us as community members and property owners or future property owners whether we are 5 and just entering the school system or 65, just watching or if your lucky enjoying your grandchildren go through the school system.. I am not going to be able to put more more into this newsletter and stay on one page so read the enclosed article. I thought the part about your market value in relation to your loan amount was really an eye-opener. If you are underwater by 50%, home prices will have to rise 7% per year for the next 10 years for you to get back to even. I am sure they are calculating in maintenance costs but that is a long range plan. It might be a good one for some people but evaluate it in terms of your own finances to see if it works for yours or let us help you figure it out.. Enclosed is the update of activity for February, 2012 thru March 2012. There were a total of 76 new listings. There were 47 pending sales. Of the residential sales there were 29 sales between $250,000 and $600,000, 8 sales between $601,000 and $999,999, 5 sale over $1,000,000, 1 commercial sale and 2 land sales. There were 34 sale completes. Their were 49 price decreases and 2 price increases. The number of current listings are up at 289 listings specific to the Santa Ynez Valley. Rates continue to fluctuate on a daily basis. Conforming 30 year fixed rates up to $417,000 are at 3.875% at no points and Jumbo Conforming Loans which are loans up to $626,500 are at 4.0% at no points and Super Jumbo Loans which are loans up to $1,000,000 are at 4.625% at no points for origination. The Jumbo 30/5 year ARM Interest Only is at 3.125% at no points. The 11th District Cost of Funds index (COFI) is down at 1.206 for the month of April. The 6 month LIBOR rate is at 0.74; last month it was at 0.74; 12 months ago it was at 0.43. The latest round of Santa Barbara Economic Forecasts are starting to come out. They are somewhat rosier than the recent previous years but not a cause for handsprings as yet. Fortunately Santa Barbara County is a unique place where national and state forecasts do not have an much applicability. We have some tried and true linchpins of agriculture, education, defense, technology and tourism. For the Valley itself we can be thankful for several of those areas includingthe wine industry which brings tourists and also provides jobs and the Chumash Casino and Resort which infuses consistent dollars into the economy and the pockets of its employees and tribal members, all of which help keep the local economy afloat. The sale of properties in the price range under $600,000 has really picked up and inventory in this range is dropping. The banks are still predicting a round of short sales but I think Santa Barbara County and the Santa Ynez Valley is looking stable at this time. That is not to mean that the upper end of price ranges over 1 million will still not see a glut of more than can be sold in a reasonable period of time. And the price of those sales really needs to be determined by what has sold in the last 6 months and not by what was in 2005; getting back to 2005 is going to take much longer than the 6 years it took for values to fall. It will be interesting to see if the cost of proper maintenance, repair and updating of the homes of those sellers who are going to hold out for the return of values to 2005 levels will equate to the rise in prices of the future. A crystal ball providing the "right answers" would be a great tool. The buyers are definitely out there now looking even in all price ranges but they are looking for "THE DEAL" and generally they are willing to wait until they find it. Are we in a Buyer or Seller's Market? I think we are in both; we bounce between the two on a daily basis; lower end inventory is down which makes properties under $450,000 few and far between but the upper end although showing some sign of life is still struggling.In either case there is still plenty of inventory to look at, There are "the deals" the buyers but if you are a Seller and want to sell, to move up, move away, get out from under, there is opportunities to get that done. In any case, talking to your realtor and an accountant or lawyer well versed in short sale, foreclosure and bankruptcy and most importantly, the local market is very important. Marlene and I are well versed and educated in all these issues and if we don't know the answers at the very least we can point you in the right direction. Being proactive will put you and our economy on the right track and in the right spot. Enclosed is the update of activity for December, 2011 thru January 2012. There were a total of 52 new listings. There were 38 pending sales. Of the residential sales there were 29 sales between $250,000 and $600,000, 4 sales between $601,000 and $999,999, 1 sale over $1,000,000, 1 commercial sale and 3 land sales. There were 35 sale completes. Their were 48 price decreases and no price increases. The number of current listings are down; however they are still very high at 244 listings specific to the Santa Ynez Valley. Rates continue to fluctuate on a daily basis. Conforming 30 year fixed rates up to $417,000 are at 3.75% at no points and Jumbo Conforming Loans which are loans up to $626,500 are at 4.0% at no points and Super Jumbo Loans which are loans up to $1,000,000 are at 4.50% at no points for origination. The Jumbo 30/5 year ARM Interest Only is at 3.25% at no points. The 11th District Cost of Funds index (COFI) is up at 1.221 for the month of February. The 6 month LIBOR rate is at 0.79; last month it was at 0.80; 12 months ago it was at 0.46. A few items of note as we end the year and start on 2012. The indices that determine adjustable rate mortgages are rising ever so slightly and slowly. Is there a reason for this? None that I can think of except the FED is slowly trying to raise the rates without causing a major panic. They tell us the economy is getting a little better which may be true in some parts of the country but I think California is still in for some more pain based on the governor's budget and the automatic cuts that are scheduled. All I continue to hope for is some stability and relative calm.. What's important for you is that you know and project on your adjustable rate loan is where it is going and how long is it going to take to get there. Need some help, we can help you figure it out. There were a lot of Pending sales these past two months and that is good; the sales are dominated by distressed sales (Contingent Short Sales and Contingent REO) sales; that is both good and not so good. Not so good that the market continues to be dominated by distressed sales (50% of the pending sales in December and 69% of the sales in January). However, it is good that the market is clearing itself of distressed homeowners. Yes, it is horribly sad that so many people are losing or have lost their homes. But this is also the opportunity for distressed homeowners to get themselves on the road to recovery. The laws are in place both State and Federally for people to recover.The big boost at the State level for right now is Senate Bill 458. It basically waives deficiency judgements for purchase money and non-purchase money loans. It should also be noted that this law expires at the end of 2012. What it means is that if you are granted a short sale by the bank, they can not come after you for the difference in what is owed and what is paid. That doesn't absolve you of some of the income tax liabilities but it can be a tremendous relief. In any case, talking to your realtor and an accountant or lawyer well versed in short sale, foreclosure and bankruptcy is very important. Marlene and I are well versed and educated in these issues and if we don't know the answers at the very least we can point you in the right direction. Being proactive will put you and our economy on the right track. Enclosed is the update of 4 months of activity for August 1, 2011 through November 30, 2011. . There were a total of 109 new listings. There were 24 pending sales. Of the residential sales there were 20 sales between $250,000 and $600,000, 1 sales between $601,000 and $999,999, 3 sales over $1,000,000, and no land sale. There were 78 sale completes. Their were 91 price decreases and no price increases. 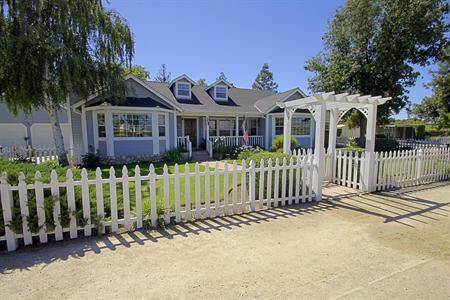 The number of current listings are down; however they are still very high at 268 listings specific to the Santa Ynez Valley. Rates continue to fluctuate on a daily basis. Conforming 30 year fixed rates up to $417,000 are at 3.875% at no points and Jumbo Conforming Loans which are loans up to $626,500 are at 4.125% at no points and Super Jumbo Loans which are loans up to $1,000,000 are at 4.625% at no points for origination. The Jumbo 30/5 year ARM Interest Only is at 3.625% at no points. The 11th District Cost of Funds index (COFI) is down at 1.218 for the month of December. The 6 month LIBOR rate is at 0.80; last month it was at 0.71; 12 months ago it was at 0.48. I am going to do the End of the Year Update with this letter since we are still struggling to get this Update back on schedule. We have worked harder mostly due to the Short Sale Market which requires not only knowledge and professionalism but boundless energy, perseverance beyond question and unbelievable tenacity. I guess we are just hard headed and stubborn enough not to let the banks win and eventually we run into someone at the bank who does understand reality and we close the deal. It just takes an incredible amount of time. Marlene and I are thankful everyday for each other as it takes two to get it all done. The results of the year are a mixed bag. There are buyer's out their with loads of confidence in the market, many of them investors or buyers looking for 2nd homes. They think the prices are great; interest rates are phenomenal and we are close to if not at the bottom of the under the $800,000 range of homes. I would say in the under $400,000 range, homes are flying off the shelf with multiple offers. That does not mean they are selling at astronomical prices but market forces are preventing them from slipping further, at least for the 4th quarter of 2011. There was still about .5% erosion per month in values for at least the first 3 quarters of 2011 but I think stability in the 4th quarter. That is an improvement over 2010 where we saw declines from .75% to 1% per month. So I have high hopes for 2012. If you have not received an accurate analysis of where your house is valued in the 4th quarter of 2011 - now is the time to do that because...."God willing and the Creek doesn't rise" that will determine your property value in 2012 and the base for future years and maybe even some increase over the long term.. The hard reality is that number is somewhere between 40-60% off the peak value in 2005 and has driven us back to the property values of 2001. And there is no area of value that is untouched by this. It does not matter if your property was valued under 1 million or over 10+ million. We have all taken the hit. The reason for the variation from 40-60% is determine by the level of maintenance your house has received. If you are in pristine condition - you are down 40%; if you have deferred maintenance and your property is not staged for showing, you are down 60%. Enclosed is the update of 4 months of activity for April 1, 2011 through July 31, 2011. Yes I know this is still late but we are working on October now and will send that with August and September in a few days. There were a total of 156 new listings. There were 53 pending sales. Of the residential sales there were 37 sales between $250,000 and $600,000, 11 sales between $601,000 and $999,999, 3 sales over $1,000,000, 1 commercial property sale and 1 land sale. There were 76 sale completes. Their were 161 price decreases and no price increases. The number of current listings are down; however they are still very high at 304 listings specific to the Santa Ynez Valley. Rates continue to fluctuate on a daily basis. Conforming 30 year fixed rates up to $417,000 are at 4.5% at no points and Jumbo Conforming Loans which are loans up to $626,500 are at 4.875% at no points and Super Jumbo Loans which are loans up to $1,500,000 are at 5.125% at no points for origination. The Jumbo 30/5 year ARM Interest Only is at 3.25% at no points. The 11th District Cost of Funds index (COFI) is down at 1.350 for the month of September. The 6 month LIBOR rate is at 0.50; last month it was at 0.45; 12 months ago it was at 0.49. It's the end of October, fall is definitely here and I have no clue as to where the past 6 months have gone. Apologies are in order for the inexclusable lateness of our communication. The only thing I can say is it is not from lack of working because this economy is making everyone work longer and harder., and we fall under that umbrella along with everyone else. Every sale is an ordeal. If it is not the applications and long negotiations for short sales and increasing demands of the REO lenders, it is the stringent lending standards which make even the "best" creditworthy employed buyers feel completely unworthy of a loan. Now for the real estate market today and its past six months. The first half of 2011 in hindsite seems to have taken a small dip from 2010. Prices seem to have fallen to 2002 levels or lower in some areas but I think it is a combination of short sale and foreclosure prices but also an issue of maintenance and upgrades. When people are having trouble making their payments there is no extra money to keep properties maintained, upgraded, and "sparkling." Well maintained properties still command the best price and in some cases push the envelope of appraised value. We have had a number of sales that have sold even when appraised value ends up being below purchase price. Amazing isn't it ....even in this market. Of course, you have to have a buyer who has a strong downpayment (they are still out there), doesn't want to deal with the hassle of bank owned or short sale (they have tried...been there , done that) but still think the interest rates and the need to find housing make this their time to buy. The value of property is still inherent. People still need a place to live and the number of new housing units being created is at an all time low. We have an increasing number of households being created but a finite number of place for them to live. At some point, and I think it is soon, we are going to notice the pressure to develop new housing. Economic theory and reality will come into play and low supply, means increased demand and increased demand will exert an upward pressure on prices. At the moment it is becoming apparent in the rental market, but soon, with a little help from increasing the number of jobs, the prices of properties will take a turn for the better. I think it will be a slow turn but anything is better than a downward spiral. Outstanding views of the surrounding mountains create the setting and ambiance of Rimfire Ranch on 2.5 acres in the Santa Ynez Valley. A beautifully maintained 3BR/2BA home with remodeled bathrooms, new tile floors in the kitchen, as well as newer appliances including Kenmore Elite stove and oven, is a one of a kind opportunity. A solar electric system runs the all electric ranch on approximately $50 per month. Spa, fencing and x-fencing with irrigated pastures, barn, kennels and paddock complete this perfect picture. 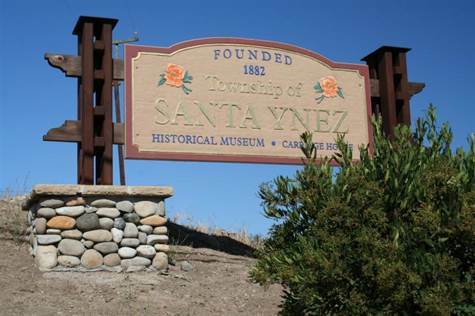 And it’s very close to the town of Santa Ynez with great restaurants, coffee house and shopping. Located off Amber Farms Road this 1 acre property with views is level to gently sloping with all utilities available. Water Services is available through Santa Ynez River Water District. Enclosed is the update of 2 months of activity for February 1, 2011 through March 31, 2011, click here to view the updates.. There were a total of 84 new listings. There were 35 pending sales. Of the residential sales there were 23 sales between $199,000 and $600,000, 4 sales between $601,000 and $999,999, 4 sales over $1,000,000, 3 commercial property sales and no land sales. There were 44 sale completes. Their were 48 price decreases and no price increases. The number of current listings are down slightly; however they are still very high at 284 listings specific to the Santa Ynez Valley. Rates continue to fluctuate on a daily basis. Conforming 30 year fixed rates up to $417,000 are at 5.0% at no points and Jumbo Conforming Loans which are loans up to $729,750 are at 5.125% at no points and Super Jumbo Loans are at 5.375% at .875 points for origination. The jumbo 5/1year ARM fully amortized is at 3.75% at 1 points, the Jumbo 5/1 year ARM Interest Only is at 4.125% at .875 point. The 11th District Cost of Funds index (COFI) is down at 1.469 for the month of April. The 6 month LIBOR rate is at 0.46; last month it was at 0.46; 12 months ago it was at 0.45. It's April and already I am thinking I have a great case of Spring Fever. It still unusually nippy out in the mornings but that doesn't seem to have affected the wildflowers on Figueroa Mountain or the hills full of mustard. Now all we need is some warm and windless spring days. Now for the real estate market. The very lower end of the market is continuing to hold; the number of new short sales, foreclosures and non-distress sales popping up on the market seem to find buyers, especially if your price range is under $600,000. The strongest swell of buyers is in the $250,000 to $499,000 range and those properties move into the pending status quickly. However, there have also been a few big deals - some not even reported in the MLS. The result by regulators is a highly restrictive QRM with a mandatory 20 percent down payment for home purchases, 30 percent minimum equity for refinancings, and mandatory debt-to-income ceilings of 28 percent (housing expenses) and 36 percent (total household monthly debt load). The implementation of something this restrictive would surely slow the housing recovery even more. What are they thinking??? Fortunately, the QRM is still a proposal open for public comment through June 10. To end on a somewhat higher note, it really is the time to buy. The slow down in construction has decreased the number of available housing units that are vacant or under construction in most metropolitan areas and we are soon going to find ourselves without anything to sell; Even in our "small Santa Ynez Valley metropolis" our investory is down under 290 - hasnt' been there for a long time. Investors are hitting the market in droves in the North County and purchasing lots of real estate because the cash flow on rental properties is starting to look very good. Is this a sign of spring or a sign of the times??? Only time will tell. Enclosed is the update of 2months of activity for December 1, 2010 through January 31, 2011, click here to view the updates.. There were a total of 59 newlistings. There were 46 pendingsales. Of the residential sales therewere 35 sales between $199,000 and $600,000, 4 sales between $601,000 and$999,999, 5 sales over $1,000,000 and 2 land sale. There were 29 sale completes. Their were 72 price decreases and 1 priceincrease. The number of current listingsare down slightly; however they are still very high at 296 listings specific tothe Santa Ynez Valley. Rates continue to fluctuate ona daily basis. Conforming 30 year fixedrates up to $417,000 are at 4.875% at .375 point and Jumbo Conforming Loanswhich are loans up to $729,750 are at 4.875% at 1 point and Super Jumbo Loansare at 5.125% at 1 points for origination. The conforming 5 /1year ARM InterestOnly is at 3.75% at 1 points, the Jumbo 5/1 year ARM Interest Only is at 3.875%at 1 point. The 11th District Cost ofFunds index (COFI) is down at 1508 for the month of January. The 6 month LIBOR rate is at 0.46; last monthit was at 0.46; 12 months ago it was at 0.38. The chart to the left reflect Yearto Date Sales for the Santa Ynez Valley only. 2010 sales were upapproximately 16.5% from 2009 which is very good. 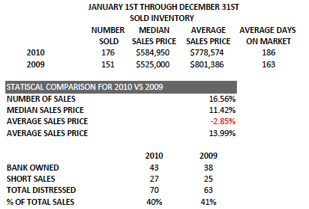 It also reflects that theMedian Sales Price was up about 11.4% from 2009. An increase in the Median Sales Priceindicates that there were a greater proportion of more expensive homes sold in2010 than in 2009. Average Sales Pricedroppped about $25,000 or almost 3%which I think indicates that prices still came down in 2010 but the dropped wasprobably more reflective of lower prices in the upper price ranges. The lowerend property priced under $600,000 has bottomed out. Average days on the marketagain is probably affected by the upper end price ranges as those propertieshave taken a longer time to sell. If ,as a seller, your property is priced in that range or, as a buyer, you arelooking in that range, the market is moving more quickly. The lower portion of the graphic indicatesthe number of properties sold in distress in comparison to the the totalproperties sold. The number of properties in distress in 2010 and 2010 wereapproximately the same percentage of the market. Enclosed is the update of activity for November 1, 2010 through November 30, 2010, click here to view the updates. There were a total of 32 new listings. There were 16 pending sales. Of the residential sales there were 10 sales between $199,000 and $600,000, 1 sales between $601,000 and $999,999, 4 sales over $1,000,000 and 1 land sale. There were 15 sale completes. Their were 30 price decreases and 1 price increase. The number of current listings remain the same; however they are still very high at 300 listings specific to the Santa Ynez Valley. Rates continue to fluctuate on a daily basis. Conforming 30 year fixed rates up to $417,000 are at 4.75% at 1 point and Jumbo Conforming Loans which are loans up to $729,750 are at 4.875% at 1 point and Super Jumbo Loans are at 5.125% at 1 points for origination. The conforming 5 year ARM Interest Only is at 2.875% at 1 points, the Jumbo 5 year ARM Interest Only is at 4.875% at 1 point. The 11th District Cost of Funds index (COFI) is down at 1.654 for the month of November. The 6 month LIBOR rate is at 0.46; last month it was at 0.45; 12 months ago it was at 0.47. Rates continue to be amazing, even with the edging up. However, the lending landscape has changed quite drastically over the past several years and everyday I learn something new. FHA loans and Mortgage Insurance requirements have changed significantly. The previous annual premium a borrower paid was up to 2.25% of the loan amount; the monthly premium was .55%. The monthly premium is now reduced to 1% of the loan amount but .9% of the loan amount for monthly payments. The annual premium is usually added to the loan amount and is amortized but the monthly premiums are due every month included in the payment and determine a buyer's ability to qualify. On a $500,000 loan that adds $5000 to the loan amount instead of $11,250; that's a good thing. But on a monthly basis for each $100,000 loan amount, the buyer contributes $75.00 for mortgage insurance premium; that makes the monthly mortgage insurance payment $375.00 for a $500,000 loan and a hefty sum for any wallet. The economic outlook for 2011 is looking better for the South Coast which should mean good things for us in the Santa Ynez Valley. My prediction and hope is that our real estate values hold a steady course and employment and new job starts will be better in 2011. My hope for us all is that we can recover, albeit slowly and move toward a stronger and healthier self, a happier and more peaceful world, and a little more personal time for us to reflect and appreciate all that we have. Better stop now before I get too mushy. To all of our friends and clients have a wonderful holiday with your families and a great New Year. Enclosed is the update of activity for September 1, 2010 through October 31, 2010, click here to view the updates. There were a total of 58 new listings. There were 38 pending sales. Of the residential sales there were 25 sales between $199,000 and $600,000, 6 sales between $601,000 and $999,999, 6 sales over $1,000,000 and no land sales. There were 32 sale completes. Their were 86 price decreases and no price increases. The number of current listings are down slightly; however they are still very high at 300 listings specific to the Santa Ynez Valley. Rates continue to fluctuate on a daily basis. Conforming 30 year fixed rates up to $417,000 are at 4.125% at 1 point and Jumbo Conforming Loans which are loans up to $729,750 are at 4.25% at .875 point and Super Jumbo Loans are at 4.875% at .5 points for origination. The conforming 5 year ARM Interest Only is at 2.75% at .75 points, the Jumbo 5 year ARM Interest Only is at 4.125% at 1 point. The 11th District Cost of Funds index (COFI) is down at 1.663 for the month of October. The 6 month LIBOR rate is at 0.45; last month it was at 0.46; 12 months ago it was at 0.46. Rates are amazing, aren't they. At least for the time being but as we all know nothing terrific lasts forever. But when is it going to change. That's the million dollar question. The lending landscape has changed quite drastically over the past several years. Practices, approvals and standards that were once widely accepted have either vanished or transformed beyond the point of recognition. Many banks, which were once extremely careless with their loan underwriting techniques and approvals, have dug themselves into a significant hole that will take many years to climb out of. Promotions such as "'100% Financing"and "No Doc Loans"' were both major contributors to the financial crisis banks and consumers are facing today. Today, banks are making sure they don't make the same mistakes again, so loan underwriting standards have become more stringent than ever before. According to a recent Federal Reserve survey, it was found that about 75% of the banks surveyed indicated they had tightened their lending standards for prime, subprime and commercial mortgages. That was up from about 60% in the previous survey. With this sharp increase in lending standards, borrowers are being turned down for real estate loans at an alarming rate. 1. Poor credit: The borrower may have a heavy down payment or excellent equity built-up in their house, but if their credit score is under a certain threshold, obtaining a new loan or refinance from a traditional bank is challenging. Even FHA (Federal Housing Administration) loans, which have traditionally catered to borrowers with lower FICO scores, have an average borrower credit score of 693, according to CNN Money, which is above the national average. 2. Insufficient liquidity: If the borrower doesn't have a heavy down payment (20%-30% for most banks) and strong excess liquidity, banks don't want to take the risk on funding their loan. 3. Lack of income: The borrower doesn''t have consistent proof of income for the last two to five years. Regardless of how good their credit score is or how much equity they have in their home, if they can't show the bank proof of income, loan approval will be tough. This can be a big hurdle in the loan process, particularly for retired borrowers. 4. Lying on the application: Banks have learned their lesson and are no longer putting up with borrowers stretching the truth on their applications. 5. Debt: Borrower has excessive debt and their debt-to-income ratio exceeds the bank's guidelines. 6. Unemployment: Most lenders will like to see at least two years of stable work to issue loan approval. 7. Self employment: Lenders are looking at self-employed applicants with a lot more scrutiny these days, making it very tough for these borrowers to get approved. Obviously some of these newly structured standards are for the betterment of the industry, and our overall economy, but at the same time, home buyers across the country are realizing quickly that reputable credit and stable income aren''92t always enough in qualifying for a loan through a traditional bank. Enclosed is the update ofactivity for August 1, 2010 through August 31, 2010, click here to view the updates. There were a total of 37 new listings. There were 16 pending sales. Of the residential sales there were 13sales between $199,000 and $600,000, 2 sales between $601,000 and $999,999, nosales over $1,000,000 and 1 land sale. There were 24 sale completes. Their were 54 price decreases and no price increases. The number of current listings are upslightly; however they are still very high at 341 listings specific to the SantaYnez Valley. Rates continue to fluctuateon a daily basis. Conforming 30year fixed rates up to $417,000 are at 4.125% at 1 point and Jumbo ConformingLoans which are loans up to $729,750 are at 4.25% at .875 point and Super JumboLoans are at 4.875% at .5 points for origination. The conforming 5 year ARMInterest Only is at 2.75% at .75 points, the Jumbo 5 year ARM Interest Only isat 4.125% at 1 point. The 11thDistrict Cost of Funds index (COFI) is down at 1.753 for the month ofSeptember. The 6 month LIBOR rateis at 0.47; last month it was at 0.52; 12 months ago it was at 0.67. The market is hot - lots ofbuyers out there but the weather is hotter. This past Sunday at 107 degrees and counting there werebuyers looking at open houses. That really says something. Dave and I were only prepared forair-conditioned open houses or at least great window coverings to keep out theblazing sun. Our summer was a little on the cool side this year by the accountsof us "Old Timers" and by that I mean long-time residents. However,the last week has been amazing---the entire county is breaking hot temperaturerecords. It should make the grape harvest--all that much sweeter. We have also had our gardener friendsreporting the tomato crop has not been as sweet. Fortunately I am still bringing in my harvest...I am up to 1tomato and 3 green peppers whichon a cost basis has not been the most profitable thing I have done recently. Mycareer as a farmer is definitely not as successful as I had hoped. I think I betterstick to real estate sales---at least there I know what I am doing. For scores between 620 and 639 the best average annual percentagerate offered was 4.9 percent. For scores between 640 and 659, the rate was 4.73 percent. For scores between 660 and 679, the rate was 4.6 percent. For scores between 680 and 699, the rate was 4.56 percent. For scores between 700 and 719, the rate was 4.44 percent. For scores of 720 and above, the rate was 4.3 percent. That means that for each20-point score increase, the average rate dropped 0.12 percent. On a $300,000home with a 20-percent down payment, a 0.12 percent decline equals about $6,400saved over the course of a 30-year mortgage. If you are trying to buy a house,here is another way to evaluate your options.